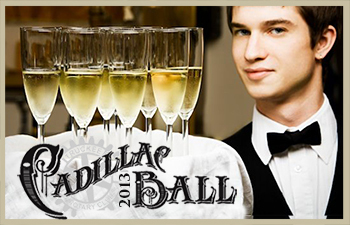 The Cadillac Ball is considered one North Lake Tahoe’s premiere fundraising events. Come for a night of gourmet dining, outstanding live entertainment and dancing, plus a silent auction and the “Change a Life” raffle. This year’s attendance is expected to include more than 300 generous residents and visitors. Attendees are asked to wear either Black Tie attire, or dress the part of old-time Truckee residents in creative costumes, such as a saloon entertainer, rustic cattleman, railroad conductor, lumberjack etc. The evening will start with a Cocktail Hour and live music, with dinner being served at 6:45 PM, and the program starting at 7:00 PM. There will also be a VIP Lounge. The Cadillac Ball at the Ritz-Carlton, Lake Tahoe is organized by the Rotary Club of Truckee and is going to be a night of fun, laughter, elegance and goodwill, so book your tickets today! Dinner and raffle tickets may be purchased through any Truckee Rotarian or by calling (530) 550-8028. For other great Lake Tahoe and Truckee events review the Lake Tahoe events calendar and book your upcoming outings. Don’t forget to make Lake Tahoe lodging bookings ahead of schedule to guarantee your stay.